Reformed Christians have a deep respect for St. Augustine. And while Augustine had a notriously high view of Grace and Predestination, he is often misused and abused by Reformed Christians who are likely to claim him as a sort of proto-Calvinist. Calvinists are likely to say something to the effect of, “Calvin took Augustine’s soeteriology to its logical conclusion.” More often than not he’s taken wildly out of context, quote-mined, or sadly, even misquoted. But Augustine never actually said that. Here’s a meme posted by “Banner of Truth”facebook page. Its spread far and wide. 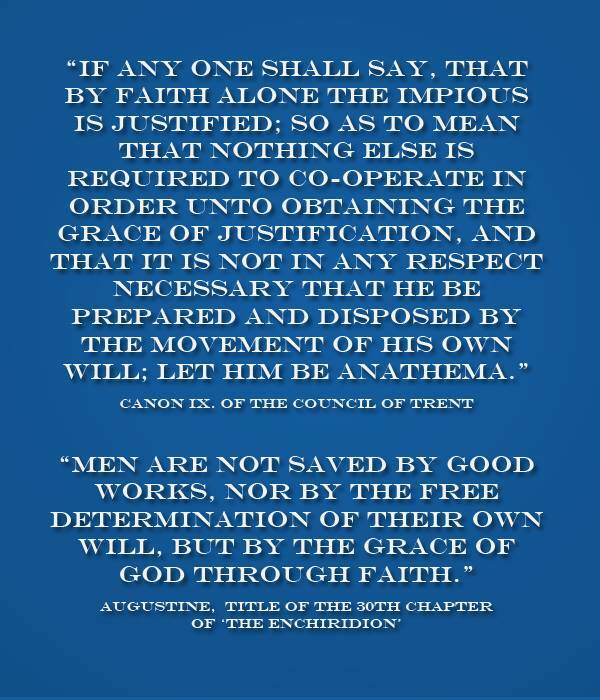 I’ve even seen a meme in this iteration, where the quote is placed next to a canon of the Council of Trent, insinuating that Augustine and Trent are contrary to each other. From the above quote, one can see that contrary to the Reformed Christian faith, St. Augustine professed that we are not saved by faith only, but rather, works are necessary. This entry was posted in Things Augustine Never Said and tagged Augustine, quote, quotes, st. augustine quote on April 13, 2016 by catholicevidence.